Turmeric is one of the most well-known natural remedies when it comes to overall health. Curcumin, a substance found in turmeric, is effective at reducing inflammation. It has been shown to ease symptoms of osteoarthritis and rheumatoid arthritis such as inflammation and pain. In multiple lab tests, curcumin has also been shown to block the growth of certain types of tumors. One study showed that a turmeric extract containing curcumin was able to stabilize colorectal cancer. Other studies suggest that turmeric may be able to help protect against various skin diseases, Alzheimer’s disease, colitis, stomach ulcers, high cholesterol levels and various other conditions. Turmeric is commonly used as an ingredient in South Asian cooking and is added to various meals as a flavor enhancer. Although it is mostly eaten with food, there are other ways to consume turmeric without having to cook up an entire meal. One of these ways is a delicious turmeric smoothie. 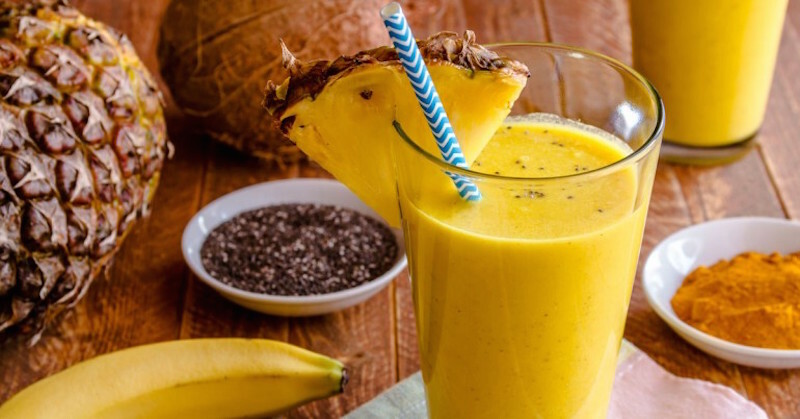 Although the key ingredient of this pineapple smoothie is turmeric, mainly due to it’s wide range of health benefits, there are many other healthy ingredients included that make this smoothie one of the best recipes for strengthening your immune system. Pineapple for one, is a highly effective anti-inflammatory food, thanks to its bromelain enzyme. Now that you know all of the various health benefits of the ingredients to this smoothie, watch the video below for step-by-step instructions on how to make one like it. Just made the pineapple smoothie … very nice, with home grown bananas, turmeric and pineapple. The recipe says 1/2 a tablespoon and the video says 1/2 a teaspoon of turmeric. Which is it? And are the chia seeds being soaked and drained? Thank you for pointing that out. 1/2 a teaspoon is correct. Hi Sara, do you have something simple e.g. 2-3 ingredients only? This one contain 9 ingredients.